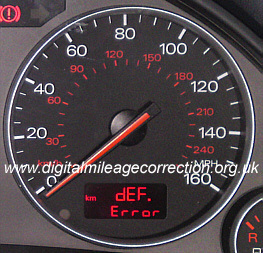 Has somebody attempted to carry out mileage correction on your Audi A4 with a crypto or non crypto dashboard and now your left with the mileage display showing either dEF - Error ? This problem usually exists because the information in the eerpom of the Bosch RB4 dashboard has become corrupt. 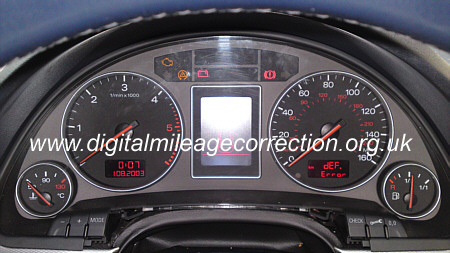 Until now the only solution to rectify this problem was to replace the instrument cluster with a new one. This meant that the vehicle would have to be taken along to your local Audi dealer to supply a new cluster and program it in to your vehicle. This job would cost you several hundreds of pounds and the embarrassment of them knowing what you have been up to. We can now offer a repair service for this problem with a 90% success rate.